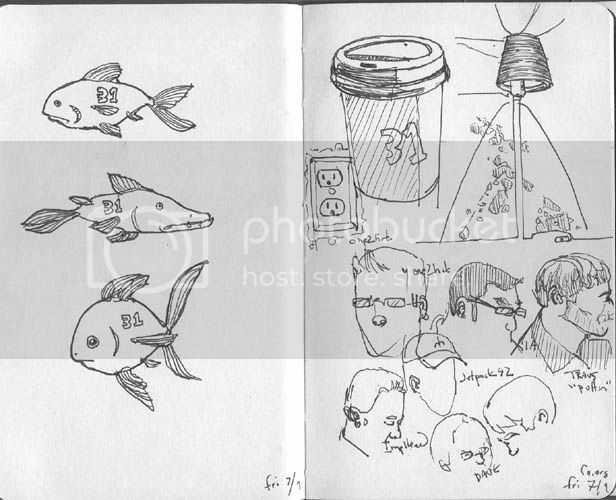 Thread: Seattle Sketch Night 7/9 PICS! So we had our first "CA sketch night" in Seattle. Almost 15 showed, if my memory serves correct. Had a great time, met some new people, saw some people I met in Texas, got my draw on, drank a couple iced mochas, drove into town under a grey canopy of clouds, cool breeze...it rocked. If anybody has anything to say about it, feel free to do so here. I figure we could post it here so as to not clutter up the local section forum space too much, plus then the other CA members can get all jealous of our cool get togethers (haha! suckers!). also, feel free to post your pictures and drawings here, if you want. Last edited by jetpack42; July 11th, 2004 at 12:51 AM. It was an awesome time. Anybody in the Seattle area that wants to join us, check out the sub forum. meet planned for next saturday. oh, and sorry Xia, my camera is so crappy, all your wIP pictures came out blurry. I guess I need to be real meticulous for that sort of thing with that chinsey camera. Sorrrrryyyyyyyyyy!! oh yeah...post some sketches yo!